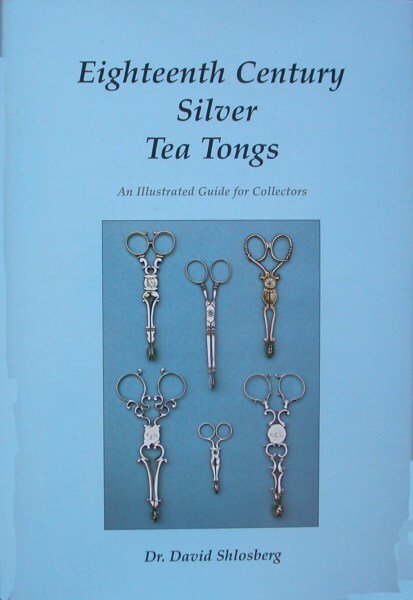 Silver Tea Tongs were extremely fashionable during the middle years of the eighteenth century. They were made predominantly in England, but examples have been recorded from France, Germany, Holland and the Scandinavian countries, as well as examples from the USA. The research that I have undertaken for my book on the subject concentrates on those produced in England and, as may be expected, the vast majority of these are marked for London makers. These charming objects of the fashionable tea table of the period began to appear from about 1720. Prior to their advent, silver tongs in the shape of andirons had served the purpose of transferring sugar pieces from the sugar bowl to the tea cup. From the early 1770s Tea Tongs were replaced by the more commonly seen sugar bows, so they had a short but very flourishing life span. Certain important facts relating to their production have emerged from my research. Arguably the most important finding is that there is clear evidence that there were goldsmiths who specialised in their manufacture; I have identified some twenty five goldsmiths who, between them, were responsible for the production of a significant majority of those surviving to the present day. During the course of my research I have seen a bewildering number of styles of Tea Tongs. Apart from a couple of fairly basic patterns pertaining to the mid to late 1740s (and probably produced to supply the demand for these items amongst the upper middle classes), there are very few examples of identical patterns of tongs to be seen. The variation in form, whilst still retaining all the elegance of design, is wide ranging and may be seen to support the theory of them being fashion statements, discussed below. There is a clear progression in style across the years of their production. Initially they were plain and purely functional. As they became items of fashion, they developed a range of designs reflecting the design changes that were occurring in other items of household decoration; they went through the rococo style from 1740 or so until this form of decoration became less fashionable and was replaced by ‘more modern’ designs. It was clearly important for the wealthy hostesses of the day to have the very latest fashion to show off to their friends. Apart from the top twenty five specialist makers alluded to above, I have seen Tea Tongs marked for another two hundred and twenty one different makers to date. The majority of these makers appear to have produced only a small number of pairs if, indeed, they did not just put their own stamp on pairs made by specialists. Nonetheless, the demand for Tea Tongs must have been great enough for these makers to be compelled to make them available to their clients. Without doubt, collectors of small silver would do well to include a couple of pairs of these delightful implements in their collections, for they represent an important part of the social history of the mid eighteenth century. In my humble opinion, they are as representative of the creative skills of the goldsmith as any of the larger, and more expensive examples of the goldsmiths’ art. Certainly, when compared to other small collectible silver, such as marrow scoops, teaspoons or caddy spoons, it seems that they are undervalued both aesthetically and financially at the moment, so collectors would be well advised to keep an eagle eye out for them when trawling the antique markets and bric-a-brac stalls in their locality.